Kustom Kwik Print, Inc. is a full service custom offset printing shop. We have made our focus on printing for small businesses and medium size businesses. We believe that the small business should not have to pay more in order to get priority service. For a general listing of our printing services and our print products, please follow the link to our Products and Services page. 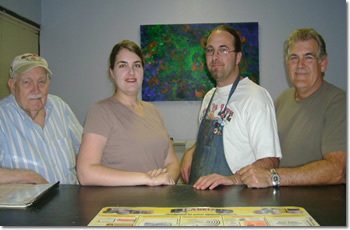 Kustom Kwik Print has served the Dallas / Fort Worth Metroplex since we opened our doors in 1974. The company was founded in Irving, TX, where it continues to reside today. Our founder, Bill Day Sr., began the company with the dream of owning and operating a printing company that could offer competitive pricing and fast turn around time to the small business market. This goal has long since been achieved and remains the cornerstone for our business philosophy. Today the Day family continues to own and operate the company three generations later.